Voters in Guildhall are weighing a Town Meeting Day ballot item that would expand their School Board from three to five members. At issue is whether the size of the board makes a difference in education policy in the small Essex County town on the Vermont-New Hampshire border. Guildhall has a two-room school, with two full-time teachers serving about 20 students in kindergarten through sixth grade. Critics such as Laura Wilson say the plan to add two administrators to the board isn’t necessary given the size of the school. She argues that the town should focus instead on electing School Board members capable of carrying out school district business. 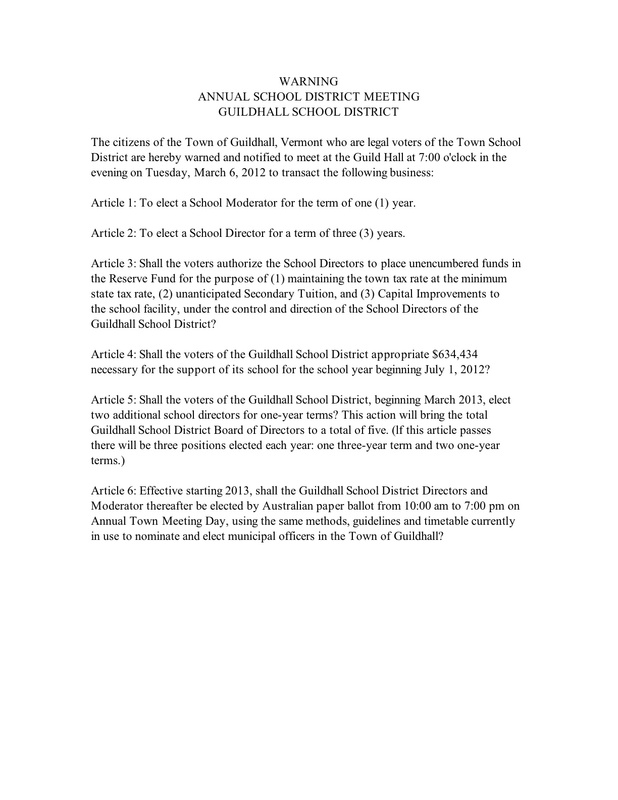 You can read the Town Meeting Day warning from Guildhall and several other towns at VPR’s Public Post. While you’re there, post updates from your city or town. For two years now, a commission created by the Vermont Legislature has been looking for ways to deliver judicial services more efficiently and affordably across the state. In Vermont’s two smallest counties, the commission proposes cutting staff and moving most judicial hearings to larger, neighboring counties. Guildhall’s welcome sign proclaims it "the only town in the world so-named." Visitors passing through this hamlet slow down to admire the marigold yellow library, a fine example of neo-Georgian architecture. But the library is rarely open, and won’t open its financial books, and that made it a hot button issue at last night’s town meeting.